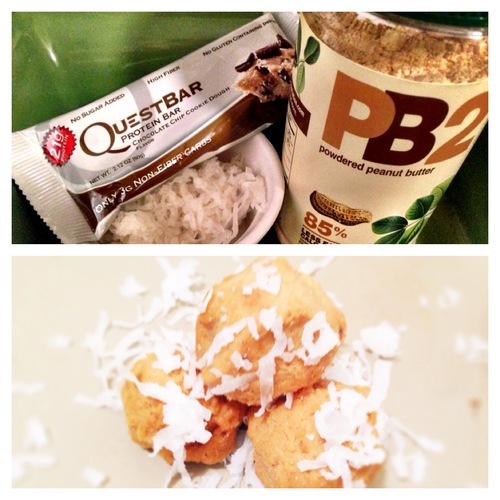 You guys know I’m a huge fan of Quest bars… I’ve recently discovered their 15 second recipes on Youtube and you can have so much fun with these guys!! I decided to try one out. Gonna be honest with you – if you do this – go for REAL peanut butter – I think it would have been better. I’m a fan of just nuking this bar for 12 seconds and enjoying pure bliss, but it’s fun to play with your food sometimes. 🙂 So, for these all you do is take a Quest chocolate chip cookie dough bar and slice it up, roll into balls then dip and cover in peanut butter, sprinkle with coconut and chill for a bit. BAM!